It is just beautiful. Made of white marble, the tower and the whole Piazza dei Miracoli, looks like icing on a cake, of perfectly molded designs, sculptures and pillars. 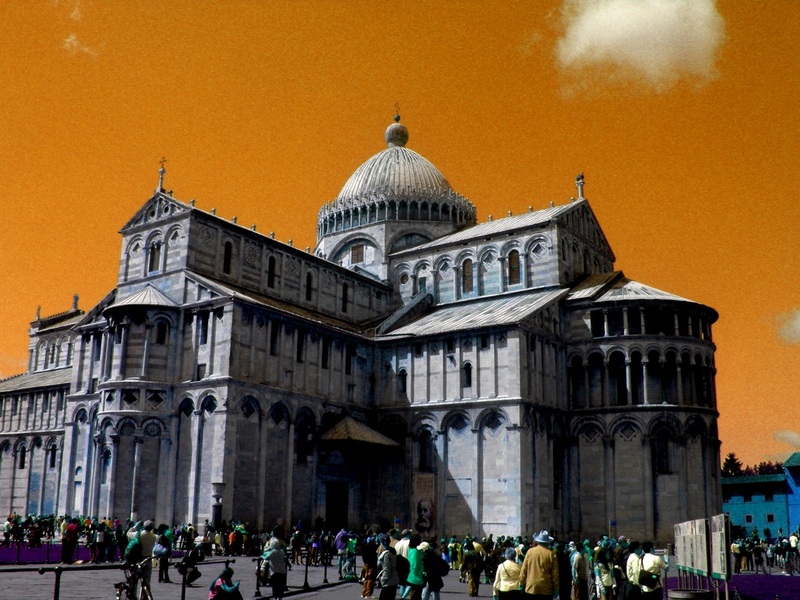 Since the Piazza dei Miracoli means Miracle's square, I think angels delight in an imaginary appetite of visual beauty. The price to visit the tower is 18 euros. I know its kind of expensive but it is worth it to visit it and go all the way up! When I visited, it was the weirdest feeling but I will not tell you about it. You have to go up and experience it by yourself. So go up and enjoy the visit! Save for that ticket by giving up 4 cups of cappuccino in the USA! Coffee in Italy is so cheap!!! 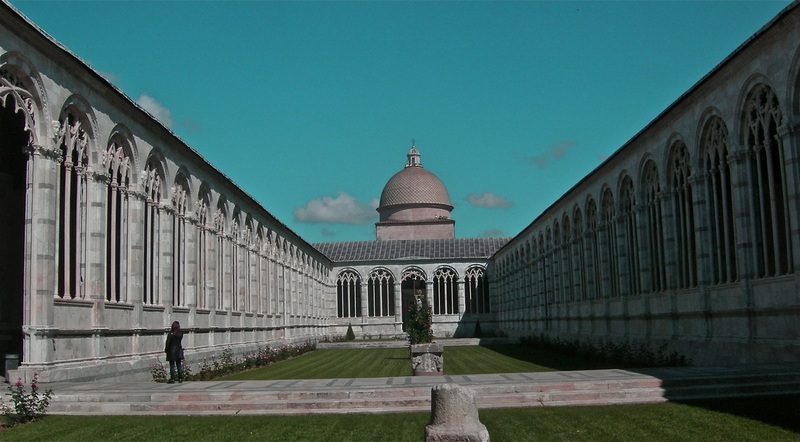 Designed by an architect of Pisa, the baptistry is another must see as here we can see a transition of two styles, from Romanesque to Gothic. Also it is the largest baptistry of Italy. 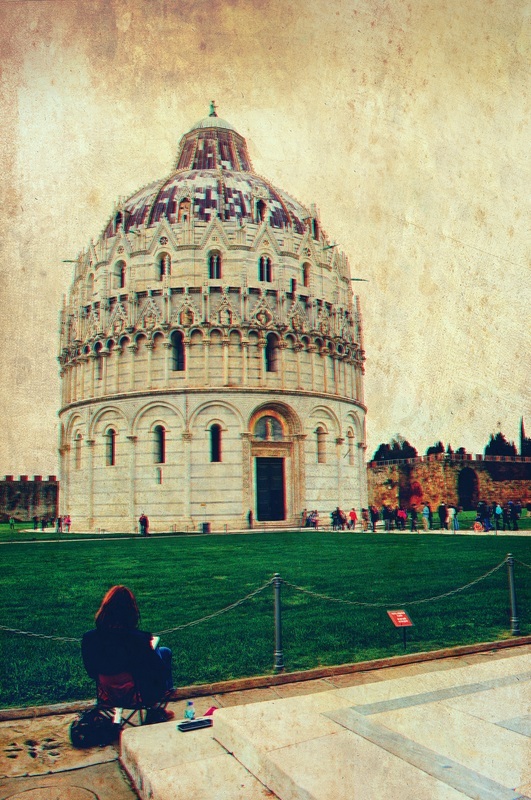 It is funny to see everyone holding the Leaning tower with their hands, feet, etc... but what about the baptistry? Well, since these buildings in Piazza dei Miracoli were built in unstable sand, the baptistry leans 0.6 degrees toward the cathedral. Fee for the Baptistry is 5. Euros. 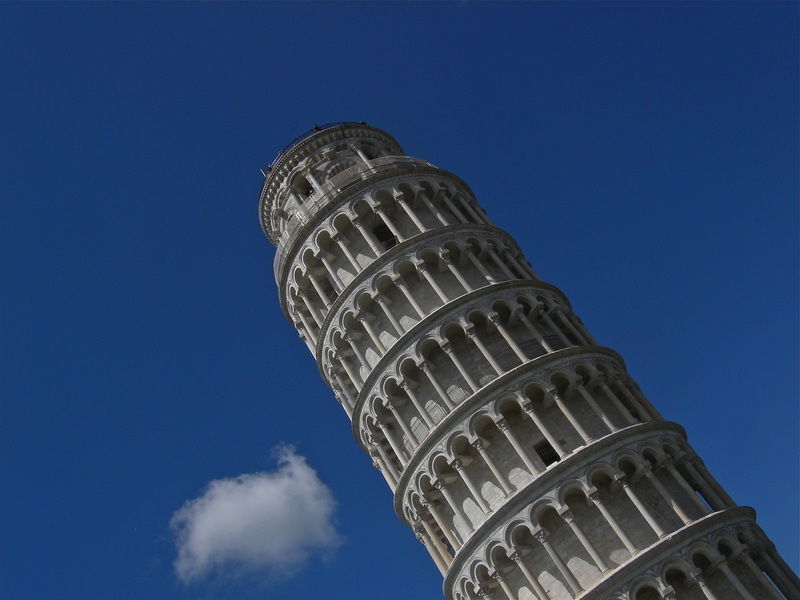 The Cathedral of Pisa is a display of beautiful Romanesque style. In that same year the Cathedral of Pisa and the Basilica of San Marco in Venice, were being built. Because of rivalry between the two maritime republics, each city wanted to show their wealth and power by building the most beautiful worship place. Inside the cathedral there are various paintings by Giovanni Battista Tempesti. Camposanto which literally translates to holy field, it is said to have been built around a shipload of sacred soil from Golgotha (Calvary) during the fourth crusade by Ubaldo de' Lanfranchi. A legend claims that bodies buried in that ground will rot in just 24 hours... However, the exact place of this soil is where the Cathedral stands now. 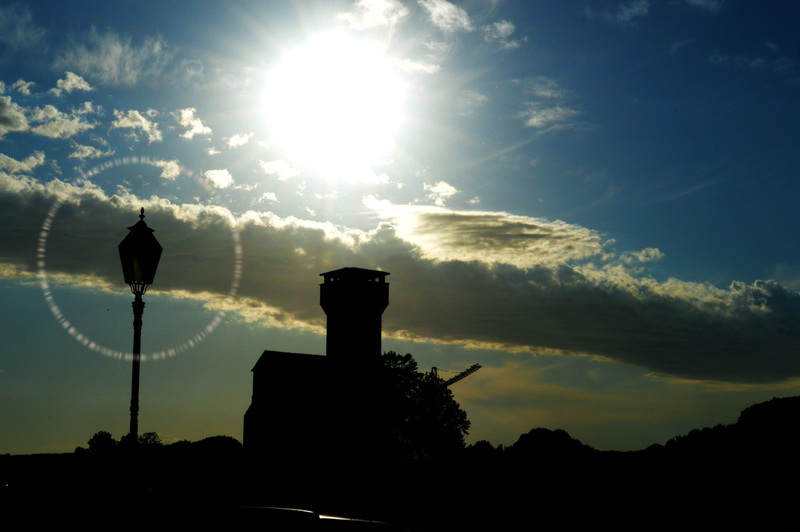 The Citadel of Pisa is a fortress in the north part of the river Arno, at end of Lungarno Simonelli, it was build to guard the access by the river Arno, and the shipyard in the middle ages, when the sea was closer to the city. Near the citadel are still the remains of the arsenals of the Republicans and the Medicis. Also the Guelph Tower, which was reconstructed after WWII, is open to the public, and from there you can have an amazing view of this beautiful city. The Scotto Garden is situated in the opposite part of La Cittadella, called the new Citadel which is another fortress built by the Florentines after their second conquest of the city of Pisa. At the end of the eighteen century, when the fortress was not useful anymore, it was sold to the church, and then to the Scotto family, a wealthy family from Livorno. 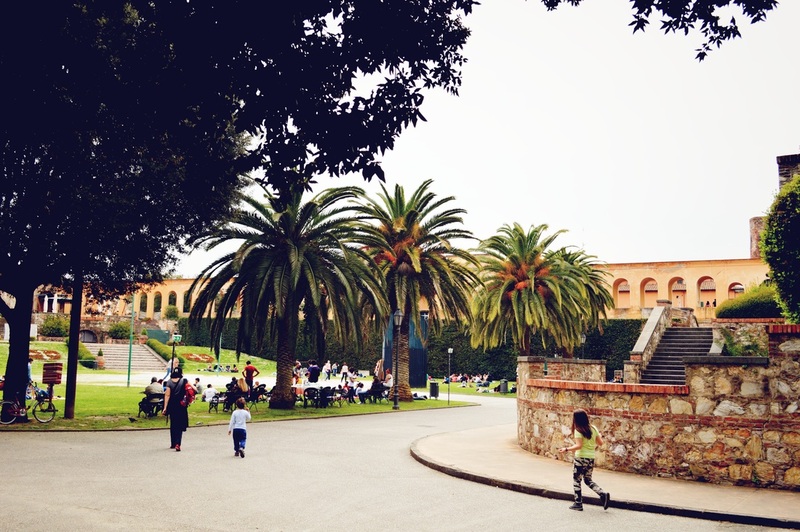 Here they build this beautiful garden that overlooks again the city and it is open in the summer for concerts, and open air cinema.